Hey everyone! I wanted to start a thread with all of the Second Dimension info in one location rather than have a thread for each game/release/publication I do, and also a place to give information on any currently in progress projects. First, I'd like to talk about the website a little bit. The website is completely written in PHP using a MySQL back-end. The platform is a custom platform, called the Affinity Web Engine, which was designed to be modular to make it easier to implement new features and to update modules without taking the entire site down (plus, I set up a test server to do all my testing in anyway). The latest update was in December with the new eShop and inventory management system. This module is called Einstein (previous known as Newton). What this allows is a dynamic system that adjusts inventory when items are purchased. For example, if you purchase 10 Genesis PCB's, the quantity available for any game will be reduced by 10 if they use that part. This allows me to do a "print on demand" type of service, rather than make a specific set of copies of a game and designate a separate stock of inventory. It's pretty robust, though the end user never sees or knows any of this. Along with that, though, is whenever you purchase anything off of the site, it creates an invoice/order item that is updated each step of the way. If you're logged in, you'll be able to check the status with more detail (and if you order without being logged in, I can assign the order to a user account). The next thing about the website is any game I publish or release that has any kind of achievement system will be supported through 2LINK. What is 2LINK? It's a system that lets you enter in the passwords, or codes, to show off your progress on the Second Dimension website. Currently one game is supported - Bomb on Basic City for the Genesis, but future titles will also support this feature, such as Handy Harvy. The games are the heart of Second Dimension, and the reason why I got into this business. Currently 2 games are available - Bomb on Basic City for the Sega Genesis/Mega Drive, and AO for the NES. I have 3 more games slated for release this year before summer time: Get'em Gary on the Nintendo NES, Handy Harvy on the Sega Genesis, and Socks the Cat on the Super Nintendo. Bomb on Basic City was developed by Vetea of Studio Vetea, and is inspired by Bomb on Pixel City by Gamopat Studios (both of which are excellent people), and is a very addicting arcade style game on the Sega Genesis/Mega Drive. Filled with humor, hidden modes of play, and unlockable features that tweak the game play, this title will have you playing for hours. An unlockable 2 player mode is also available in the game so you and a friend can go head to head against each other, where player 2 controls the C++ ground units and the goal is to shoot Papi down before he destroys the buildings and the C++ units! AO is a puzzle game where you control a brick, and your goal is to stand the brick in the goal pit to advance to the next level. The brick has 2 different positions: laying down (takes up 2 floor tiles) and standing up (takes up 1 floor tile). You have to maneuver the brick around the game board without falling off, and in some instances, obstacles or weak floors will block your passage. You start off with a score of 999, and as you progress, the score decreases. You can still finish the game even with the score at 0, so it's really just a way to track how well you do to progress through all of the 30+ levels. You can also play 2 player mode, which is a race to the finish. Whoever finishes all of the boards first wins! AO was a purchase off of another developer, nemesys, as a means for Second Dimension to enter the world of NES games/releases. Here's a list of what's coming up in 2017! Get'em Gary is an arcade style game for the NES, inspired by games such as Donkey Kong, Wrecking Crew, and Disney's fictional game Fix-It Felix Jr. You control Gary, and your goal is to repair all of the windows with your mystical squeegee and close the shutters while avoiding the objects Rusty throws down on you (bombs, Genesis consoles, and bowling balls). As you progress up the building, the levels become more challenging, and if you make it far enough, additional challenges await you! A bomb stress ball, because who doesn't like bomb stress balls? The Steam/PC version is the actual NES game, just modified to work with Gradual Games GGvm, a virtual machine platform to run NES games (the ROM data in this version isn't complete, so reproductions of this version would result in a soundless game). Get'em Gary is Second Dimensions first NES game, and was programmed by Roth of Sly Dog Studios. Get'em Gary is a single player only game. Socks the Cat may or may not be available after the Kickstarter orders are filled. As soon as I know, I'll let you all know I also have another NES title slated for 2017, but I'm not ready to announce that just yet, as I want to do something special for the release. 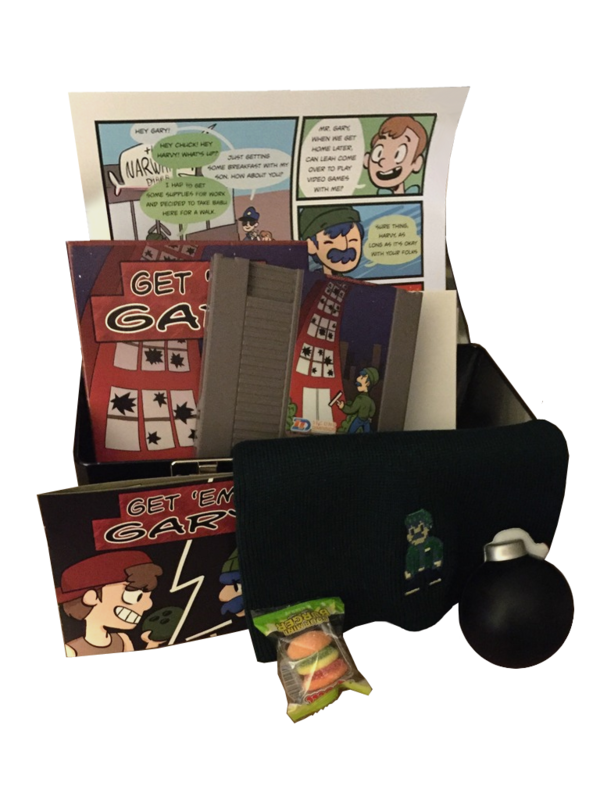 Second Dimension offers additional items that allow you to make your own physical copies of your games. I currently offer NES NROM-256 PCB's, Sega Genesis/Mega Drive PCB's for 2 MB or 4 MB games, as well as SRAM games, and also Sega Genesis replacement cartridges and cardboard cartridge trays. While I program games for Second Dimension, I've also worked on several commission projects, one of which was the port of Retroscribe's Blow'em Out for the Sega Genesis, and continue to work on projects with other retro companies as well as individuals who just want a game made for themselves. Feel free to post feedback on anything, and if you have any questions, feel free to ask!